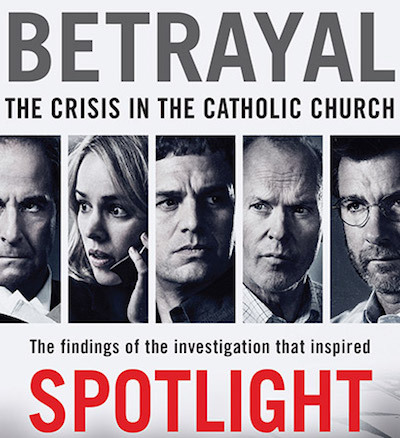 Betrayal: The Crisis In The Catholic Church was first published in 2002, after The Boston Globe's Spotlight investigations team exposed the abuse of children by Catholic priests. That case has been compared to The Washington Post's Watergate investigation, and it inspired the film Spotlight. The updated edition, released alongside the film, has a preface by Spotlight's director and screenwriter: "We hope that our movie, along with the rerelease of this incredible documentation of the Globe Spotlight Team's reporting, might help further the argument for traditional investigative journalism". It also has a new afterword analysing the repercussions of the investigation: "The crisis seeped deep into American popular culture, transforming how Catholicism was viewed and treated." Like All The President's Men (and No Expenses Spared), Betrayal was written by the investigative journalists themselves (namely Matt Carroll, Kevin Cullen, Thomas Farragher, Stephen Kurkjian, Michael Paulson, Sacha Pfeiffer, Michael Rezendes, and Walter V Robinson). It includes copies of the documents obtained during the investigation, and detailed notes.